Nothing too much here, just some video clips from when The Heyday was in town. 20 Students Show Up to AG Silver: Who's to Blame? I was one of those 20 that went. Â It was quite sad to only see 20 students and staff there. Â AG Silver had a great performance. A friend and I talked with one of the band members after the show, and all he could ask is where everybody was. Â Well…where was everybody? I understand that there are several underlying factors. Â One, it’s the weekend before Thanksgiving. Â Everybody is working on projects or just staying in and getting ready to go home for a bit. Â Also, there was a performance in the theater by Jay Sefton of “The Most Mediocre Story Never Told”. Â There were a lot of good college football games on, and bands brought in by CUB can be hit-or-miss. However, I think what it came down to was publicity for the event. Â Most people only heard about AG Silver when I mentioned that they were performing. Â Posters were put out, but it was a very passive advertising method. Â Also, by this point in the year, students have been bombarded with poster and flyer after poster and flyer. Â They’re all over the place, and blend into each other. I think another problem was that there is the stigma that a Club 21 event is a pay event. Â Let me inform everybody that it is free to attend ANY Club 21 event the college hosts. Â The only charge comes if you are over the age of 21 and decide to purchase a wristband. Â The experience is not detracted from if you are under 21. So how could CUB improve attendance? Â Why did, say, Blessid Union of Souls do so well compared to AG Silver. Â Well, for one, Blessid played at the beginning of the semester as part of Welcome Back Bash. Â Freshmen were heavily encouraged to go as part of their First Year Experience classes. Â And yes, Blessid does have name recognition. Â But looking past that, what did CUB do differently? For one, they advertised in every form. Â RSS feed? Â Yep. Â Facebook Event? Â Yep. Â Rock? Â Pretty sure they painted it. Â Banner on Gilman? Â Yep. Â Word of mouth? 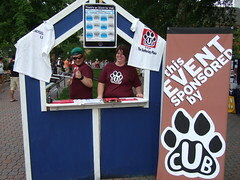 Â Most CUB members wore shirts with the concert info on it. Â Table Tents? Â On every table in Gilman and Izzy’s. Â And yes, there were posters that were hung up. Â Also, advertising was put out more than two days before the event. CUB does a lot of good work. Â So don’t think I’m bashing them. Â I’m just sharing ideas to help all organizations, not just CUB, advertise events better. I will run any press release for an event at Marietta College, no matter which organization wrote it. 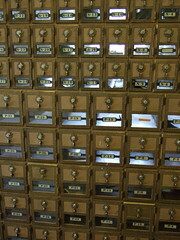 Â Just send it to me (check the contact page) and I’ll check it and post it if I think it meets my criteria. Let me finish by asking this question. Â Why didn’t you go to AG Silver’s concert? AG Silver will be performing tonight at the Gathering Place. Â It is a Club 21 night, so beer and malt beverages (last I had heard Mike’s Hard Lemonade would be added to the selection) will be offered to those of legal age that purchase a bracelet. The band is currently on a tour of colleges to promote their new album and and to help raise money/awareness for clean water in Africa. The show starts at 9 PM, but doors open at 8. Live from Relay for Life! Writing on the Mall will be live from Relay for Life at Marietta College from 8 PM until 2 AM. Â Watch our Facebook Page, either @WriteOnTheMall or @PatrickHahe for Twitter action, Our YouTube page for videos, or our Flickr page for photo uploads. Â There may be the occasional update on here, as well. Â STAY TUNED!